3.3 To enter into a contract through our website to purchase products from us, the following steps must be taken: you must add the products you wish to purchase to your shopping cart, and then proceed to the checkout; if you are a new customer, you must then create an account with us and log in; if you are an existing customer, you must enter your login details; once you are logged in, you must select your preferred method of delivery and confirm your order and your consent to the terms of this document; you will be transferred to our payment service provider's website, and our payment service provider will handle your payment; we will then send you an initial acknowledgement; and once we have checked whether we are able to meet your order, we will either send you an order confirmation at which point your order will become a binding contract or we will confirm by email that we are unable to meet your order. 3.4 You will have the opportunity to identify and correct input errors prior to making your order by reviewing the order prior to payment checkout process and. 4.1 The following types of products are or may be available on our website from time to time: Gifts and homewares. 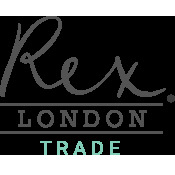 In view or our rights in terms of branding and trademark protection when listing or offering for sale a rex London product on a website you should follow the following guideline. a) Brand accreditation should always be Rex London. Displayed in either product title or description text and if applicable website category under brands. b) Products should not be left unbranded or inferred to be your own design or branding. Rex International ltd reserves the right to request removal of any listings that contravene our guidelines and restrict the supply of goods for breaches of our guidelines. 8.1 Our policies and procedures relating to the delivery of products are set out in detail in our delivery policy document. 8.5 We deliver products to addresses on the UK mainland and the following groups of countries. (b) receipt by us in cleared funds of all amounts due in respect of the product including delivery charges where applicable. (c) all the other provisions of these terms and conditions will cease to have effect, except that [Sections 1.3, 6.4, 7.2, 7.4, 10, 12, 17, 18, 19, 20, 21 and 22] will survive termination and continue in effect indefinitely. 21.2 We reserve the right to refuse supply if we consider the customer premises ,website or selling on third party websites detrimental to our image. 22.1 Subject to Section 12.1, these terms and conditions, together with our delivery policy and our returns policy, shall constitute the entire agreement between you and us in relation to the sale and purchase of our products and shall supersede all previous agreements between you and us in relation to the sale and purchase of our products. 24.2 These terms and conditions are available in [the English language only]. 25.3 Our principal place of business is at 3-4 Allied way London W3 0RL. 2.1 Copyright (c) 2005 Rex international ltd.
3.6 Notwithstanding Section 3.5, you may redistribute our newsletter in [print and electronic form to any person. 7.1 If you register for an account with our website, you will be asked to create a password. 7.2 Your account ID must not be liable to mislead and must comply with the content rules set out in Section 10; you must not use your account or user ID for or in connection with the impersonation of any person. 9.1 In these terms and conditions, "your content" means all works and materials including without limitation text, graphics, images, audio material, video material, audio-visual material, scripts, software and files) that you submit to us or our website for storage or publication on, processing by, or transmission via, our website. 11.2 You can let us know about any such material or activity by email . 13.5 We will not be liable to you in respect of any business losses, including without limitation loss of or damage to profits, income, revenue, use, production, anticipated savings, business, contracts, commercial opportunities or goodwill. (g) suspend or delete your account on our website]. 14.2 Where we suspend or prohibit or block your access to our website or a part of our website, you must not take any action to circumvent such suspension or prohibition or blocking[ (including without limitation [creating and/or using a different account])]. 20.1 Subject to Section 13.1, these terms and conditions, together with [our privacy and cookies policy, shall constitute the entire agreement between you and us in relation to your use of our website and shall supersede all previous agreements between you and us in relation to your use of our website. 23.1 This website is owned and operated by Rex International Limited. 23.2 We are registered in [England and Wales] under registration number 1578798, and our registered office is at 3-4 Allied way London W3 0RL. 23.3 Our principal place of business is at 3-4 Allied way London W3 0RL. 2.1 We offer free standard delivery to all mainland UK addresses on all orders over GBP 200 (including VAT)]. (a) if your delivery address is on the United Kingdom mainland, the typical period for delivery of products by this method is 3 to 7 working days. Scottish Islands, Channel Islands, Isle of Man, Scilly Isles. Orders over £750 = Free delivery. Please note: minimum carriage paid order value excludes VAT if applicable. If you would like to collect your order from our warehouse there will be a £7.50 packing charge. 8.1 If an initial delivery attempt is unsuccessful, please contact customer services. 9.1 If your products remain undelivered the delivery service provider may leave a card at your address, with instructions on how you may collect your products, including a time limit for collection. 10.2 If our delivery service provider is unable to deliver your products, and such failure is your fault we may agree to arrange for re-delivery of the products; however, we reserve the right to charge you for the actual costs of re-delivery even where the initial delivery was free of charge. 1.1 We understand that from time to time you may wish to return an incorrectly delivered or damaged a product to us. 1.2 We have created this policy to enable you to arrange collections /returns of products to us in appropriate circumstances. 1.5 This document does not affect any statutory rights you may have as a consumer such as rights under the Consumer Contracts Information, Cancellation and Additional Charges Regulations 2013 or the Consumer Rights Act 2015). 3.2 Please attach images /photos for each product you are claiming for. 3.4 Incorrectly completed returns forms may not be processed and will slow down the process. 5.2 We will not refund to you the original delivery charges or proportion thereof relating to the returned product. 5.5 We will process the refund due to you as soon as possible and, in any event, within 7 days following the day we receive your returned product. 7.1 This website is owned and operated by Rex International ltd.
7.2 We are registered in England and Wales under registration number 1578798, and our registered office is at 3-4 Allied way, London W3 0RL. 7.3 Our principal place of business is at 3-4 Allied way, London W3 0RL.